Jeff shares personal tips and scriptural truths to help you live as a modern-day disciple of Jesus Christ. Have you ever tried walking on water? It is definitely not something we can do on our own. But this scripture passage is an invitation for each of us to get out of our comfort zones and come to him. One of the ways we can do this is by sharing the good news of the Gospel with people he puts in our paths. Jeff talks about what to say to others about God as well as tips for approaching people. When we share the message of the Gospel, the Holy Spirit confirms that message in those hearts. One person plants the seed, another waters it, and God allows the growth. How do you share your faith with other people? Do you want to learn how to read minds? All you have to do is think about what you wish people would do for you, and then do it for them. You’ll find it’s exactly how people want to be treated. It’s like reading their mind. Do you want understanding, forgiveness, compassion, respect, and friendliness from others? They want that from you as well. We can also look to Scripture to discover how people want to be treated, especially the fruits of the Holy Spirit. “But the fruit of the Spirit is love, joy, peace, patience, kindness, goodness, faithfulness, gentleness, self-control; against such there is no law” (Galatians 5:22-23). I’m speaking with Fr. Josh Johnson, pastor of Our Lady of the Rosary Parish in Baton Rouge, Louisiana. Fr. Josh has a new book out, Broken and Blessed, about how we are broken and our Church is broken, but that the mercy and blessings of God surpasses all our failings. We discuss this theme of brokenness: how to respond to it in others, what to do about it in the Church, and what God thinks of us when we fall. Stick to the three pillars of Lent for the full forty days with this strategy from Jeff Cavins. We hear about fasting, almsgiving, and prayer so often during Lent that the words can become bland and lose meaning. But these practices are not arbitrary measures designed to make us miserable for forty days. They are spiritual disciplines specifically aimed at three areas of weakness in our souls. They help us overcome sin and become more like Jesus. Jeff shows us the effectiveness of these practices by comparing biblical figures from Genesis and 1 John to Jesus’ example in the Gospel of Matthew. He also provides some alternate ways of thinking about fasting, almsgiving, and prayer to help rejuvenate our commitment this Lent. Is Your Parish Stuck in Traffic? Parish life sometimes feels like being stuck in traffic. Things aren’t moving forward, resources are limited, tempers flare, and it feels like there’s nothing we can do to move things along. But Jeff heard an interesting take on this from Fr. Josh Johnson. He said, “You’re not stuck in traffic. You are traffic.” Without knowing it, we can contribute to parish gridlock. Jeff points out several areas where we aimlessly honk our horns instead of doing something to ease the tension, and finds Scripture verses that can help us avoid these tendencies. In today’s episode, Jeff tries something new. He wants you to meet his friend Dr. Edward Sri. Dr. Sri is a theologian, speaker, author of several bestselling books, and also hosts a podcast. He just authored a brand new book entitled “No Greater Love: A Biblical Walk Through Christ’s Passion.” In addition to the book, he went to Israel to film videos that allow you to meditate on Christ’s passion in a much deeper way. If God is going to wipe away our sin, couldn't there have been another way besides crucifixion? 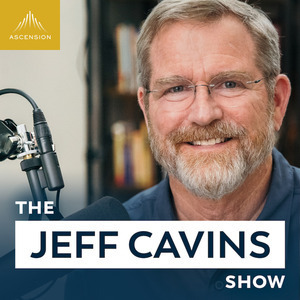 For the full shownotes, go to ascensionpress.com/thejeffcavinsshow or email us at thejeffcavisshow@ascensionpress.com to get them delivered stright to your inbox. It is the people who feel like outcasts that Jesus longs to touch. He longs to give their lives significance and meaning. Jeff explains the context behind the bible passage about the woman who touched Jesus’ garment (Mark 5:25-34) and shows you ways to reach out and touch him today. Peace of mind is something we all struggle towards, but rarely achieve. Today, Jeff talk about why we are unable to obtain peace and gives you five practical ways to reach this elusive state of mind. Jeff explains how a true disciple not only believes, but listens, reflects, and acts on the Word of God. If you want to change the shape of your day, change the shape of your morning...that’s where it all begins. Next week is The Jeff Cavins Show’s 100th episode and we want to do something to celebrate! 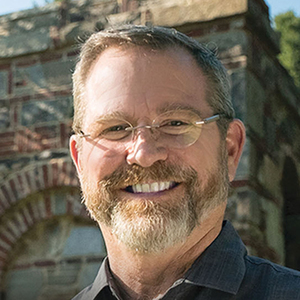 We will be giving away three signed copies of various books Jeff has written: The Activated Disciple, Walking with God, and My Life on the Rock. Have you heard of the land of milk and honey? More than just a literal location, the land of milk and honey is a metaphor for two lifestyles of living. One is easy while the other is difficult. Learn how to use the geography of the Promised Land can help you in your walk with the Lord. Back by popular demand, Jeff compiles thirteen more motivating Scriptures to help you discern the future and to help you in times of suffering and fatigue. To start the new year off right, Jeff compiles twelve motivating Scripture verses to encourage and motivate you during times of fear, impossible situations, and unbelievable obstacles.